On the 11th July 2016, full of hope and optimism, we caught the cruise ferry from Portsmouth to St Malo. It was an overnight sailing, so we had a lovely dinner and then slept in a little cabin for the crossing. 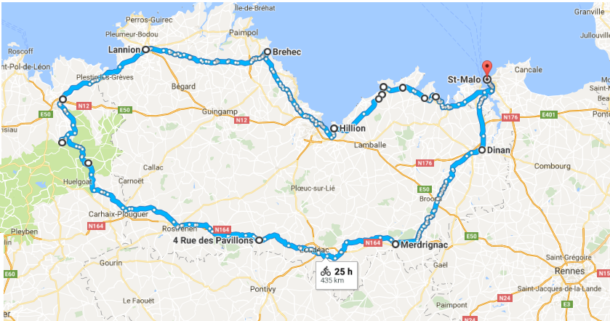 The first day in Brittany made us question our decision to cycle camp there, as the weather wasn’t great (a tremendous head-wind and changeable conditions: sunny one minute and raining the next) and the area was tremendously hilly! 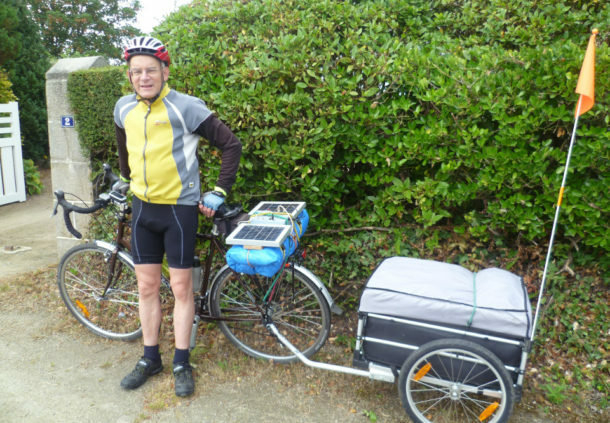 This year Tom had decided to purchase a two-wheeled trailer to attach to his bike so that we could go cycle camping with the tandem when we go to a flat area in Germany in August. 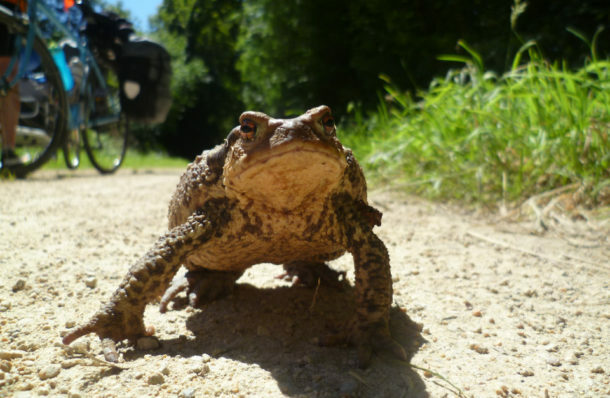 Well, in his (lack of) wisdom, he decided to test it out in Brittany, so he had a tough ten days of cycling ahead! 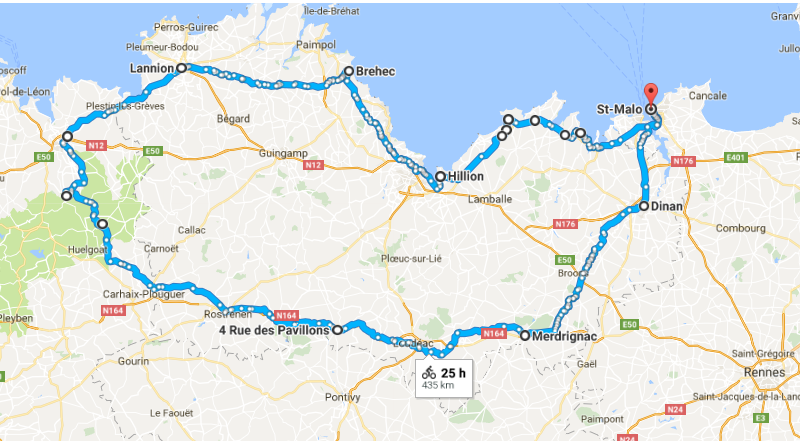 On this first day we cycled from St Malo along the coast to St-Briac-sur-Mer and Fréhel to Hillion. Although we’d booked a campsite for the first night, we ended up spending the night in a miniscule caravan instead of our tent, as there was a massive wind coming in off the sea, and it poured with rain just as we arrived. The second day was similarly hilly and windy/rainy, as we cycled on or near the coast up the peninsula via Pordic and Plouha to a campsite near Bréhec. Here we struck gold: the campsite turned out to be on a grassy terrassed area right on the top of a hill, with glorious unobstructed views out to sea. Even better, the weather cleared up and it was a lovely sunny evening. We cycled into a tiny nearby fishing village and enjoyed crêpes and plenty of French wine. The next day was Bastille Day, and although the weather was threatening in the morning, it became sunny in the afternoon and we enjoyed our ride across the peninsula (no coastal hills today!) to the town of Lannion, where we’d booked a hotel for the night. On the 15th, the weather changed and was to remain hot and sunny until we left France. We had a very hilly ride to the quaint mediaeval town of Morlaix, where the lovely mediaeval houses lie under a massive, imposing viaduct. We were very hot by the time we arrived here at lunch time – and no wonder, as we discovered it was 34°C. However, it was at this point that our route changed: we had reached “La Véloodyssée”, a 1200 km long cycle route which runs all the way from Roscoff on the Brittany coast, down the Atlantic coast to Spain. The section we were to cycle proved to be in a national park, so it was lovely and shady. The path took the old Breton steam train route, so although not completely flat, it had only gentle inclines and descents. 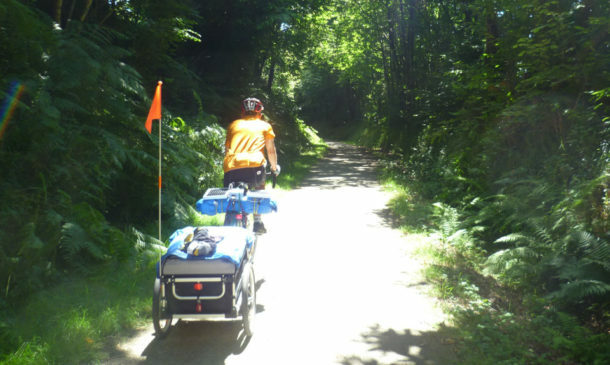 We went off the route at Le Cloitre-Saint-Thégonnec to our campsite, which was in a delightful tree-lined area and extremely quiet – only a few cycle campers there. On the following day we continued on the “green route” for only a short distance, as we wanted to visit “Huelgoat”, a pretty village in the mountains. Mountains is right! We had some massive hills to climb to reach the town, and Tom had plenty of cause to regret his decision to take a trailer! We did stop to see some spectacular waterfalls on the way, though, and still arrived by 2pm in time for a nice French lunch in the town square and a ride around the town, before cycling along the beautiful lake to find the local Camping Municipal. The following day – 17th July – we were back on the green route. We cycled into a town called Carhaix-Plouguer, only to discover that France’s largest music festival was in full swing! The town was heaving with people, and the routes to the Nantes-Brest canal that we hoped to cycle along had been blocked off. Luckily, there was another “voie verte” (traffic-free cycle route) to our destination, and this proved to be better, as along the canal we would have been in the full sun. We didn’t get to our chosen campsite in Gouarec until 5.30pm and collapsed in the shade, too hot even to put up the tent. It was a lovely, quiet campsite, run by two keen British cyclists! On the following day we enjoyed a short ride along the canal, stopping to visit an old ruined abbey (the Abbaye de Bon Repos), before leaving the canal to cycle northeast on another voie verte to Merdrignac. Again, although it wasn’t too hilly, it was a reasonably tough ride as the cycle routes are all on crushed stone or compacted sand, so there is a lot of resistance on the tyres. We were glad of the dappled shade, though. The next day was the toughest yet. We were quite tired by this time – mainly due to the extreme heat – and didn’t get going until 11am. We thought we only had 30 miles to cycle on this day, but the cycling paths we had decided to continue upon turned out to be much longer than the road route. In addition, the route turned back onto the roads, so we had to cycle for several hours in the full sun. We had to stop every four or five miles for a rest and a drink. The route was very pretty though, winding through lovely countryside and quaint French villages. 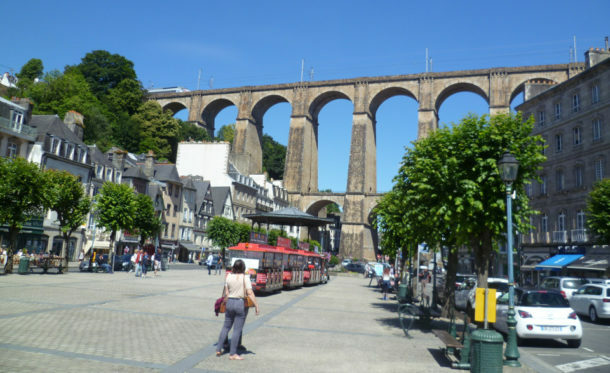 However, because it was so hot and we had to stop so often, we didn’t arrive at our final destination – Dinan – until 7pm, having done 50 miles. For a while we hadn’t thought we would make it. Well, no wonder it was so tough – the Dutch cyclists we camped next to in Dinan told us it was 39°C! The following day was equally hot, so we decided to take the train to St Malo instead of cycling, to give us time to have a good looked at the beautiful, mediaeval, walled city of Dinan. There were many sights to see here; we were particularly delighted with the lovely old cathedral which had some of the loveliest stained glass windows we had seen anywhere. There was an organist practising while we looked at it, which added to the atmosphere. The 21st July was the last day of our holiday, and was simply the cruise ferry back to Portsmouth (including a three course lunch followed by a long sleep in our cabin!) and the train home. We did a total of 350 miles. We loved Brittany, with its quaint medieval towns and beautiful scenery. 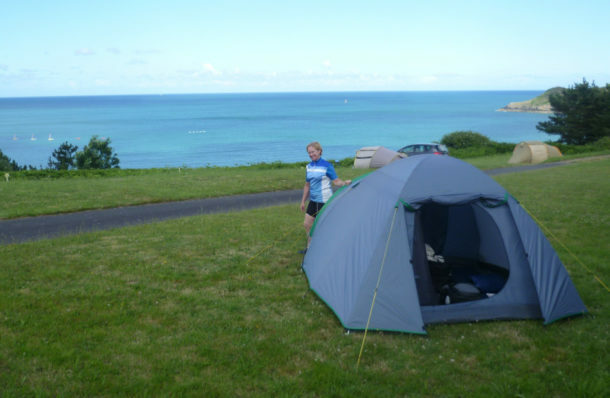 Our advice to any cyclists wishing to tour there (and especially if carrying camping gear!) is to keep the mileage down to 30 miles or less a day due to the very hilly terrain.